The co-partners of #CripTheVote, Gregg Beratan, Andrew Pulrang, and Alice Wong, are delighted to have guest hosts Alecia Deon and Alex Haagaard join us for a discussion on chronic pain and opioids. If you might be overwhelmed by the volume of tweets and only want to see the chat’s questions so you can respond to them, check @DisVisibility’s account. Each question will tweeted 5-6 minutes apart. 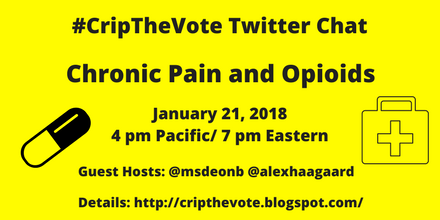 Welcome to the #CripTheVote chat on chronic pain and opioids. We are excited to have guest hosts @msdeonb @alexhaagaard with us today! Note: During this chat we will focus on the usage of prescription opioids for pain relief, not for recreational purposes. Q2 For those who are comfortable sharing, what are the most misunderstood aspects of living with chronic pain? What are your thoughts on the media coverage of opioids and chronic pain? States and pharmacies in the US are taking steps to curb the abuse of prescription opioids by limiting the amount of pills per script or the # of prescriptions a doctor can give. Q8 What are some policy changes you would like to see that would support people who need treatment for addiction and protects access to prescription opioids to those who need it? This concludes the #CripTheVote chat on chronic pain and opioids. Thank you to our guest hosts @msdeonb @alexhaagaard! Please keep the convo going. 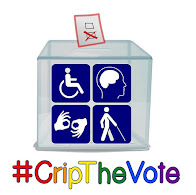 A Storify of this #CripTheVote chat will be up shortly. Yes, we are aware Storify will be ending in May 2018.